Almost five centuries as a Portuguese colony came to a close with independence in 1975. Large-scale emigration, economic dependence on South Africa, a severe drought, and a prolonged civil war hindered the country's development until the mid-1990s. The ruling Front for the Liberation of Mozambique (FRELIMO) party formally abandoned Marxism in 1989, and a new constitution the following year provided for multiparty elections and a free market economy. A UN-negotiated peace agreement between FRELIMO and rebel Mozambique National Resistance (RENAMO) forces ended the fighting in 1992. 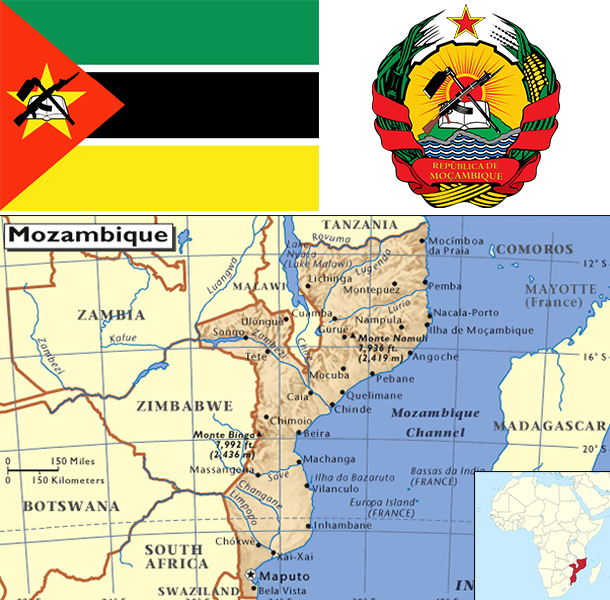 In December 2004, Mozambique underwent a delicate transition as Joaquim CHISSANO stepped down after 18 years in office. His elected successor, Armando Emilio GUEBUZA, promised to continue the sound economic policies that have encouraged foreign investment. President GUEBUZA was reelected to a second term in October 2009. However, the elections were flawed by voter fraud, questionable disqualification of candidates, and FRELIMO use of government resources during the campaign. At independence in 1975, Mozambique was one of the world's poorest countries. Socialist mismanagement and a brutal civil war from 1977-92 exacerbated the situation. In 1987, the government embarked on a series of macroeconomic reforms designed to stabilize the economy. These steps, combined with donor assistance and with political stability since the multi-party elections in 1994, propelled the country’s GDP from $4 billion in 1993, following the war, to about $30.9 billion in 2014. Fiscal reforms, including the introduction of a value-added tax and reform of the customs service, have improved the government's revenue collection abilities. In spite of these gains, more than half the population remains below the poverty line. Subsistence agriculture continues to employ the vast majority of the country's work force. A substantial trade imbalance persists although aluminum production from the Mozal smelter has significantly boosted export earnings in recent years. In 2012, The Mozambican government took over Portugal's last remaining share in the Cahora Bassa Hydroelectricity Company (HCB), a significant contributor to the Southern African Power Pool. The government has plans to expand the Cahora Bassa Dam and build additional dams to increase its electricity exports and fulfill the needs of its burgeoning domestic industries. Mozambique's once substantial foreign debt has been reduced through forgiveness and rescheduling under the IMF's Heavily Indebted Poor Countries (HIPC) and Enhanced HIPC initiatives, and is now at a manageable level. In July 2007, the US government's Millennium Challenge Corporation (MCC) signed a $506.9 million Compact with Mozambique that ended in 2013. The Compact focused on improving sanitation, roads, agriculture, and the business regulation environment in an effort to spur economic growth in the four northern provinces of the country. Citizens rioted in September 2010 after fuel, water, electricity, and bread price increases were announced. In an attempt to lessen the negative impact on the population, the government implemented subsidies, decreased taxes and tariffs, and instituted other fiscal measures. Mozambique grew at an average annual rate of 6%-8% in the decade up to 2014, one of Africa's strongest performances. Mozambique's ability to attract large investment projects in natural resources is expected to extend high growth rates in coming years. Revenues from these vast resources, including natural gas, coal, titanium and hydroelectric capacity, could overtake donor assistance within five years.